26 Days until the Barrie Colts Home Opener! 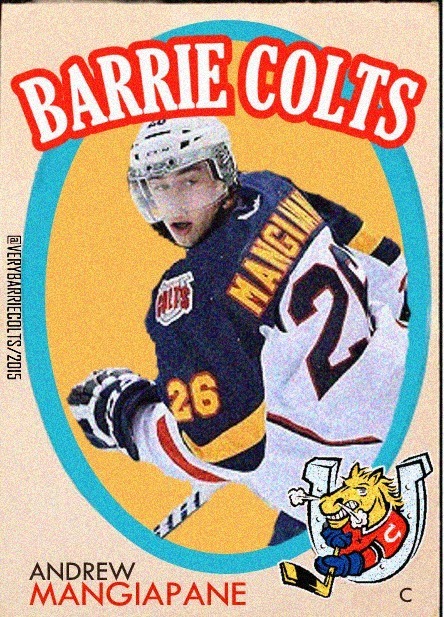 (Andrew Mangiapane) #OHL - Very Barrie Colts | A website covering the Barrie Colts of the OHL. 26 days until the start of the Barrie Colts 2017-18 regular season! Andrew Mangiapane wore 26 with the Colts for 3 seasons. In September of 2013, Mangiapane joined the team as a free agent. 2013-14 was his rookie season and he scored 24 goals with a total of 51 points. The following season he would double that production with 104 points (43 goals; 61 assists). He was not the only Colt to score more than 100 points that season. Captain Joseph Blandisi and Kevin Labance also were included in the “100 points club”. At the 2015 NHL Draft, Mangiapane was drafted 166th overall by the Calgary Flames. The following 2015-16 season would be Andrew’s last with the Colts before moving on to the AHL. His final season with the Colts was his best production wise, scoring 51 goals and 55 assists. Mangiapane served as an alternate captain that season. Over 3 OHL seasons, Mangiapane played in 195 games. He totaled 118 goals (4th most all-time for Colts), 143 assists (6th most all-time for Colts) and 261 points (5th most all-time for Colts). His 51 goals in 2015-16 was only the 3rd time in team history a player has scored more than 50 goals. Only Joseph Blandisi (52 in 2014-15) and Bryan Cameron (53 in 2009-10). In fact, Mangiapane is the only player in the history of the team to be an all-time points-leader, TWICE! Okay, maybe that isn’t true.. But Mangiapane is arguably one of the team’s best players of all time! Last season, Andrew played in the AHL with the Stockton Heat. In 66 games, he scored 20 goals and added 21 assists. His 41 points was 4th most on the team.